Images from the Fall 2006 Northshore Chapter of Trout Unlimited stream rehabilitation project at Barr and Kissee Creeks. The projects goal is to remove invasive canary reed grass and blackberries from the lower reaches of Barr and Crissy creeks and revegetate with native plants and to add large woody debris to the stream margin, so that overwintering and sheltering habitat is created in the stream channel during high water events. This should improve the survival of steelhead and coho during their overwintering. As the native vegetation grows, the lower reaches of these creeks should be better shaded to cool the creek water, as well as for providing riparian habitat for birds and mammals. All images copyright © 2006 J. Andrew Towell http://www.troutstreaming.com No commercial use, altering of the images in any manner, nor reposting of the images is permitted without the express prior written permission of the copyright holder at troutstreaming@gmail.com . Images from the Fall 2006 Northshore Chapter of Trout Unlimited stream rehabilitation project at Barr and Kissee Creeks. 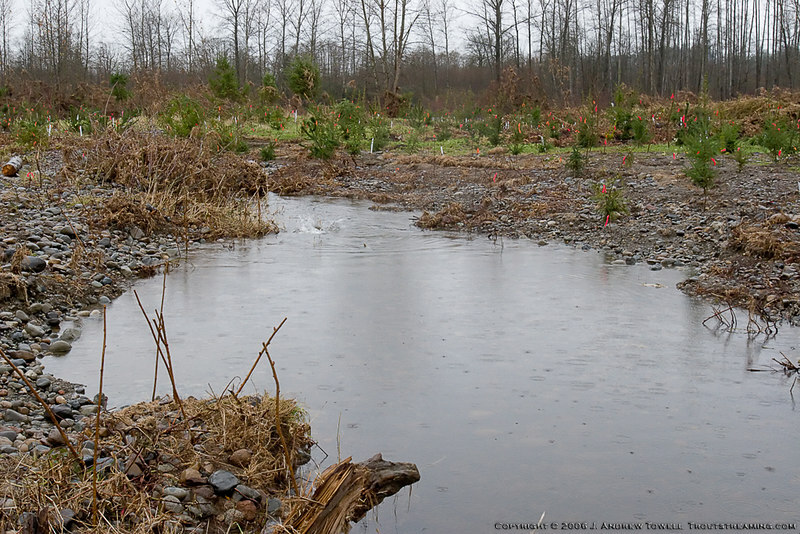 These images include spawning Chum Salmon; the revegetation work, and the large woody debris after a record high water. The projects goal is to remove invasive canary reed grass and blackberries from the lower reaches of Barr and Crissy creeks and revegeate with native plants and to add large woody debris to the stream margin, so that overwintering and sheltering habitat is created in the stream channel during high water events. This should improve the survival of steelhead and coho during their overwintering i nthe Skykomish river system. As the native vegetation grows, the lower reaches of these creeks should be better shaded to cool the creek water, as well as for providing riparian habitat for birds and mammals.